If you're getting overrun with squirrels and you need a way to trap them and get rid of them, you've come to the right place! If you want to reliably get rid of squirrel, you’ll definitely need traps, and we have the answers you’re looking for. Our top pick is the Rugged Ranch Trap. It's designed to hold large numbers of squirrels, and can even be modified to drown them one at a time if you don't mind putting in a little time and elbow grease. Two doors into the trap double the chances of the squirrels entering the trap. In addition to any bait you put out, squirrels are naturally curious and will explore the trap, eventually pushing their way inside. It also has the added advantage of being able to be left out for extended periods of time before you have to empty it. What Types of Squirrel Traps Are There? Where Is The Best Place To Put Squirrel Traps? Check out our summary list below, or keep reading for a more in-depth review of squirrel traps. Squirrel traps come in several varieties; lethal, non-lethal, single animal, and multi-animal types. 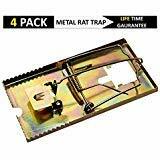 The non-lethal trap usually catches squirrels in a rectangular box trap. There are two basic varieties, wire cage traps, and Sherman traps. The main difference between the two is that the Sherman traps have solid sides, top, and bottom whereas the wire traps are made of heavy gauge wire. Caged and trapped animals often become enraged and will try to attack anyone handling the cage they're in, so the advantages of a Sherman trap with its solid sides, immediately becomes obvious. 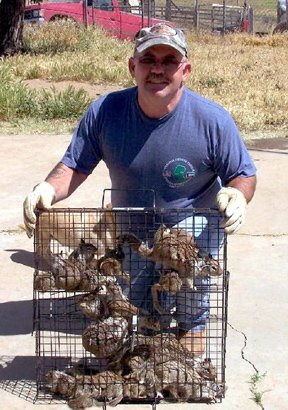 There are also multiple-catch traps which capture more than one squirrel at a time, and single-catch traps which only catch them one at a time. 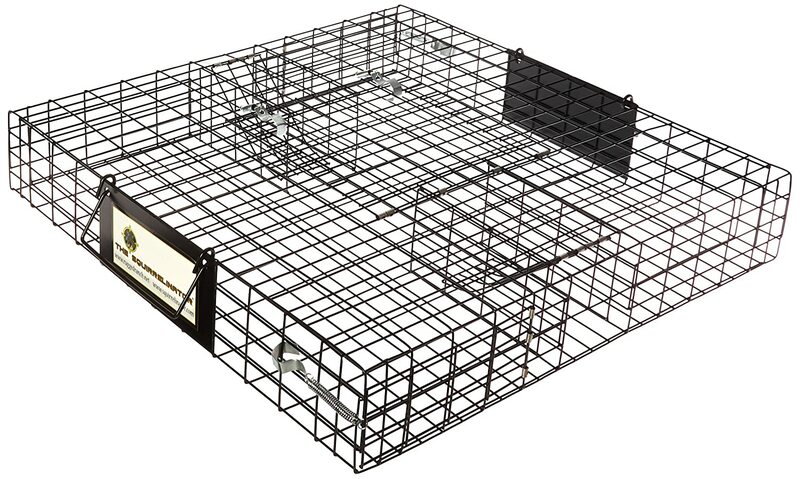 Squirrel traps can be built in one of three basic designs; flat snap traps, tube traps, or box traps. Snap traps, commonly used for catching mice and rats, work just as well on squirrels. Apply a thin layer of bait to the trigger and set it out where squirrels are prone to run and play. Also put them in areas where they've been gnawing on your patio furniture, wiring, decking, or other property, and it won't be long before you start catching them. 99 percent of the time it kills them instantly. Tube traps are basically just snap traps inside a round metal or plastic tube. Squirrels are naturally curious and will poke around inside anything they find. A little bait can be added to lure them in faster, but either way, once they go inside they'll trigger the trap and be killed. Electric traps use electricity to electrocute squirrels that crawl inside them. Squirrels are small enough they can be electrocuted by 4 D-cell batteries. These traps can also work off of corded power from an electrical outlet. Squirrels usually live in and around trees. They run up and down the trunks, leap from tree to tree on the branches, and run along utility lines. These are the best places to locate your traps. The base of trees, especially if there bushes or shrubs around the base, are the number one spot for traps. They'll encounter the traps on a daily, sometimes hourly basis as they scamper back and forth, and will soon overcome any fear they might have of them. Once that fear is gone, their natural curiosity will take over and you'll start catching them. The base of phone poles and utility poles are also good areas for trap placement. You can put them on the ground near the poles or attach them to the poles themselves. You also attach traps directly to the trunks of trees. Squirrels are notorious for running across the roof of your house or business, making those prime locations for your traps. It helps if you have easy access to the roof for checking, emptying, and re-baiting your traps. Place the traps near the tree branches or utility lines they use to gain access to your roof. We looked at five different squirrel/rodent traps. 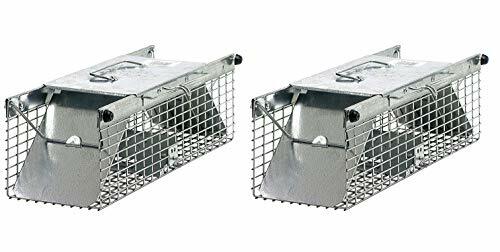 Our #1 pick goes to the Rugged Ranch Squirrelinator Trap, a two-door trap which catches multiple squirrels at the same time. If you wanted something to kill the little varmints outright, our second choice is the Tube Trap Squirrel Trap, a surprisingly strong snap trap that kills them outright. Be careful handling any trap because they all have moving parts that can injure your hands and fingers. This two-door trap works especially well in areas with large squirrel populations where they're used to sharing resources and food supplies. Throw a little bit of whatever they're already eating in your yard inside the trap and they'll gladly come after it. You should be able to catch several squirrels at a time. Since this is a live trap, you can purchase it with or without the optional basin. The basin is simply a plastic form that you lower the cage into once the squirrels are in it. Fill the basin with water, put the cage down in the water, and the squirrels drown. After that, empty the squirrels into the trash, re-bait the trap and set it back out again. All traps work best if you leave them open for several days before setting them. Bait the trap and let the squirrels get used to being fed inside it. Then, once you've gained their trust, abuse it by setting the trap and catching them. You can also modify this particular trap by cutting a small escape hole in one side. Insert a PVC pipe with an elbow in it, and suspend the bottom of the pipe over a bucket or trashcan full of water. The squirrels get into the cage, find their way out, slide down the inside of the PVC pipe into the water and drown. All you have to do is scoop them out and toss them in the trash. This tube trap has a spring for killing squirrels that is so strong it's scary. When it goes off it sounds like a gunshot, but it kills them dead bang. These traps have do a tendency to rust, so as soon as you get it, spray it with Rustoleum or satin. After that, you're good to go. Put the trap out where the squirrels are the most numerous. Don't set it the first couple of days. Sprinkle some bait in and around it to give them a chance to get used to it. Then begin setting the trap every morning. By that evening – if not sooner – you should have a dead squirrel in it. Removing the dead squirrels isn't for the faint of heart; there'll be blood and bodily fluids on the trap. Wear some disposable latex gloves while handling the trap and the body. Rinse the trap off after each use. Dry it before resetting and re-baiting it. This trap is strong and well constructed. It takes advantage of squirrel's natural tendency to want to get inside things. Even without bait, they'll eventually crawl inside out of curiosity. This 2-door live animal trap works better as a 1-door trap. Getting both spring-loaded doors to release at the same time, with the same strength, is overly tricky. It works best when you keep one door shut then put the bait back against it, forcing the animal to crawl the length of the trap, over the trigger to get to it. The instruction manual is badly written. To correctly set the trap, watch this YouTube video. It shows you exactly how to do it. Live capture traps are ideal for humanly catching squirrels (and other small critters). You can then dispose of them as you see fit. Smoothed internal edges keep the animals from being injured while they're inside. Most importantly is the solid metal roof. Captured squirrels may become enraged and try to attack when you pick up the cage. The metal roof ensures they can't reach your fingers no matter what they do. The best way to hold the bait in place is with peanut butter. A very thin layer is all it takes. This forces the animal to scratch and scrap to get the bait, and those actions are will almost always trigger the trap. Sometimes the old standby is the best. 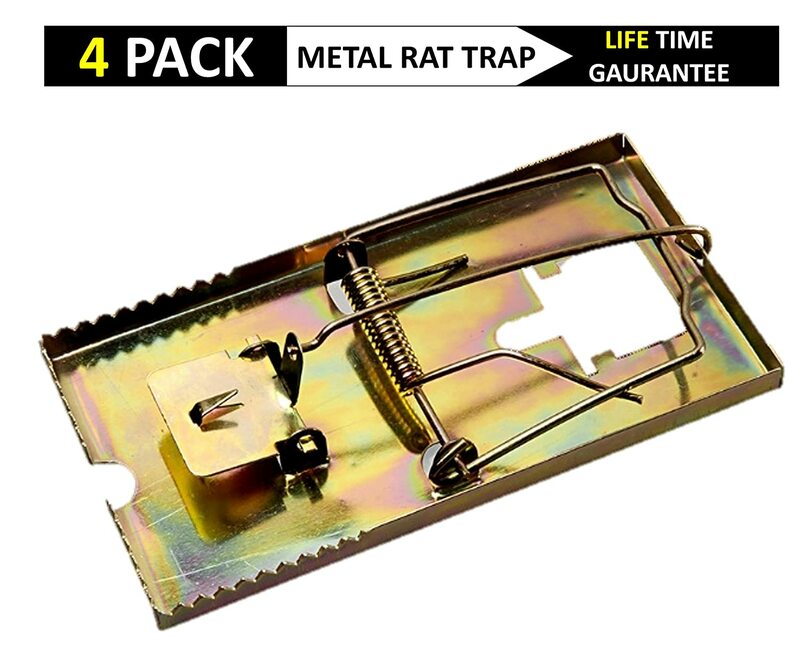 These heavy duty rat traps have a powerful spring that snaps closed in the blink of an eye, killing the animal instantly. These rat traps are well designed and are as equally adept at killing squirrels as they are at killing rats. These traps have a strong, sturdy construction so you can use them and reuse them over and over again. They're made of galvanized metal so they don't rust. This means they can be used either inside and outside. There isn't any poison needed with these traps. The triggers are very sensitive, so it doesn't take much to set them off. For best results, put a thin layer of peanut butter on the trigger, then press the bait firmly into the sticky peanut butter. This method ensures the squirrels will have to scratch and pry at the bait to get it loose, triggering the trap in the process. Don't put big globs of peanut butter or large seeds on it. The more they move around on the trap, the greater the chance they'll trigger it. Squirrels can carry fleas and lice. Wear some disposable, latex gloves when you remove them from the trap, to avoid coming into contact with any parasites they may be carrying, as well as their blood and other bodily fluids. Quick, painless, and humane, this electric trap zaps squirrels, rats, and other small rodents with 7000 volts of either battery power (4 D-cells) or plug-in power. 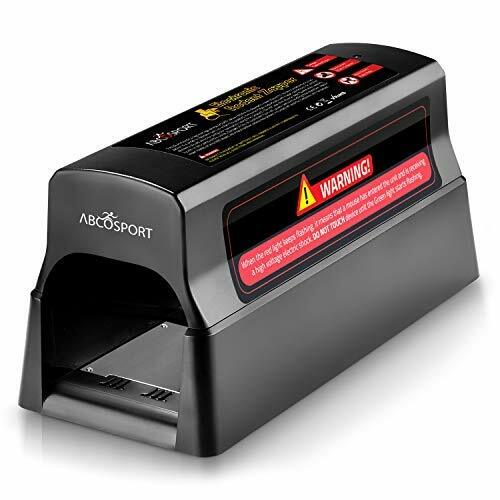 LED lights indicate whether the trap is actively electrocuting an animal, warning you to keep your distance, or has a dead animal in it. The powerful jolt is strong enough it even killed a curious skunk that once stuck its head in the trap. There's no ugly “blood and gore” mess to clean up after each use. Simply tilt the trap down over the trash and the animal slides right out. Then set it up again, which involves nothing more complicated than turning it off, setting it in place, then turning it back on. The battery option lets you place this trap outdoors, even in the rain. Because this is an electrical device, you need to take extra precautions when using it. If it's raining, then for safety reasons, don't set it in standing water so you don't give yourself a painful shock when you're setting it or picking it up. When the batteries wear out you'll have to buy more, or get an extension cord to plug it in. The top opens up so you place your favorite bait inside to lure the squirrels. There are a lot of good squirrel traps on the market today. During the course of our research though, we can to the conclusion that the Rugged Ranch Products SQRTO Squirrelinator Trap is the best of the best. Easy to set and use, this trap does a great job. It's had good reviews everywhere you turn and a fantastic track record of success. If it works, don't fix it. Our 2nd place choice was the Tube Trap Squirrel Trap. 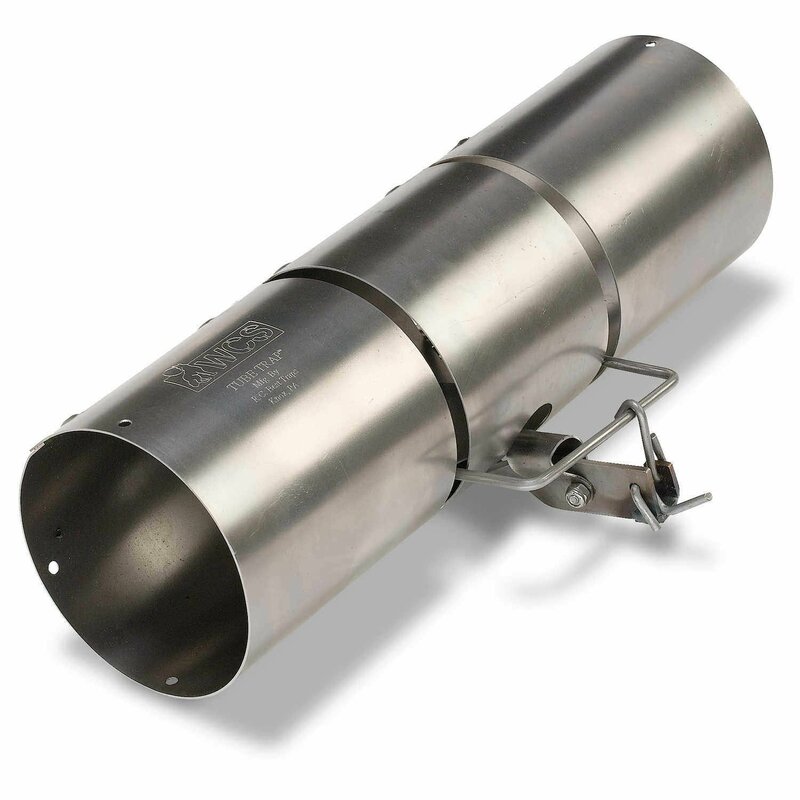 A snap trap in a tube, this trap will kill any squirrel that triggers the trap by getting too curious for its own good. This trap is strong so watch your fingers!